You’ve probably seen food labeled with the green and white sticker indicating it’s organic, but what does organic actually mean? To bear that “organic” label, according to the USDA, food must be grown without the addition of most conventional pesticides, fertilizers made with synthetic ingredients, or sewer sludge. Ew! Additionally, organic food cannot have undergone bioengineering or irradiation. This means that farmers must use other methods to control weeds, insects, and plant diseases. Many of these methods have been used for hundreds of years and include crop rotation, natural fertilizers and pesticides, and plastic row covers. The methods are usually more labor intensive and more expensive, which is why organic produce costs more. 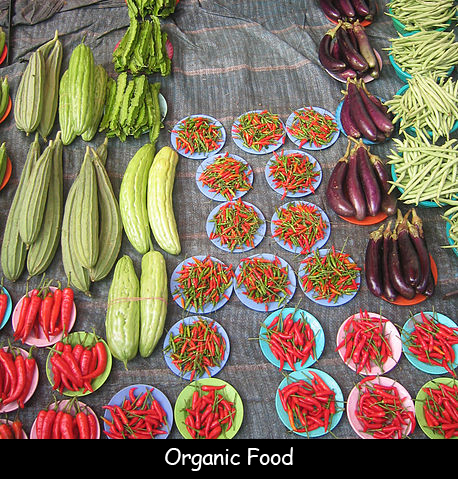 Organic farming methods are generally better for the environment and less likely to pollute water. Scientists aren’t sure if organic food is more nutritious, but it is probably safer. It generally tastes better, although in some cases, that’s not true. Sometimes organic produce might be smaller or lower in quality than conventionally produced fruits and vegetables. Some fruits and vegetables are more likely to have problems with insect pests than others. Grown conventionally, these foods contain more pesticides than others. For example, apples attract all kinds of insect pests. Conventional growers use a lot of pesticides on apples. Strawberries, cherries, spinach, grapes, peaches, tomatoes, and peppers also usually contain higher amounts of pesticide residue. Fruits and vegetables that grow underground or have a protective outer shell, such as avocados, pineapples, mangos, onions, kiwis, and melons tend to have lower levels of pesticide residue. Farmers who want to become organic must go through a lengthy (and expensive) process. Food processors must also be certified organic. Question: Should I buy organic food? Answer: If you live in an area where organic food is available and your family can afford it, buy organic, especially produce like apples and strawberries. Don’t agonize if organic isn’t an option. The benefits of eating a diet rich in fruits and vegetables—even conventionally grown fruits and vegetables—outweighs the risks. Think about eating a varied diet and avoiding foods that contain a lot of fillers, additives, and preservatives, e.g., junk food. Visit Kids Health to learn more about organic food. Declan, Tobin. " Organic Food Facts for Kids ." Easy Science for Kids, Apr 2019. Web. 25 Apr 2019. < https://easyscienceforkids.com/organic-food/ >.